On Feb. 28, 2013, the earth opened up in Seffner, Florida, and Jeffrey Bush fell to his death. Local authorities decided they could not safely recover the body: excavating the rock and sand would cause more collapse and more danger. 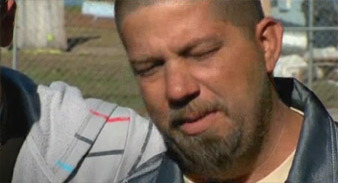 Jeremy Bush, who tried to save his brother, Jeff, says his parents are ‘going through hell’ after Jeff died in a Florida sinkhole Feb. 28. Then, on March 12, an Illinois golfer fell through a sinkhole — possibly associated with an abandoned mine — on the 14th hole. Mark Mihal, 43, survived an 18-foot fall with just a sore shoulder, after his golfing companions fished him out with a rope. 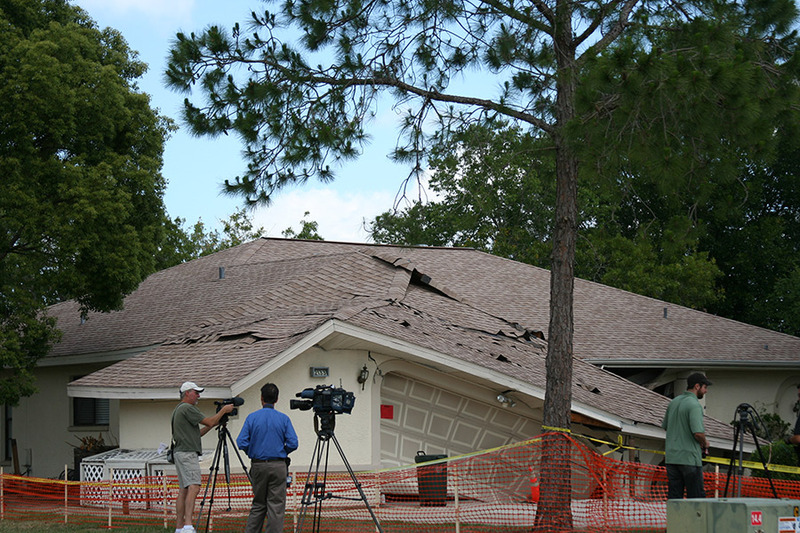 This house suffered severe damage in Brooksville, Fla., 50 miles north of Seffner, site of the recent tragedy. The incidents are graphic examples of the dangers of taking geology for granted. Earth is not always as solid as a rock. 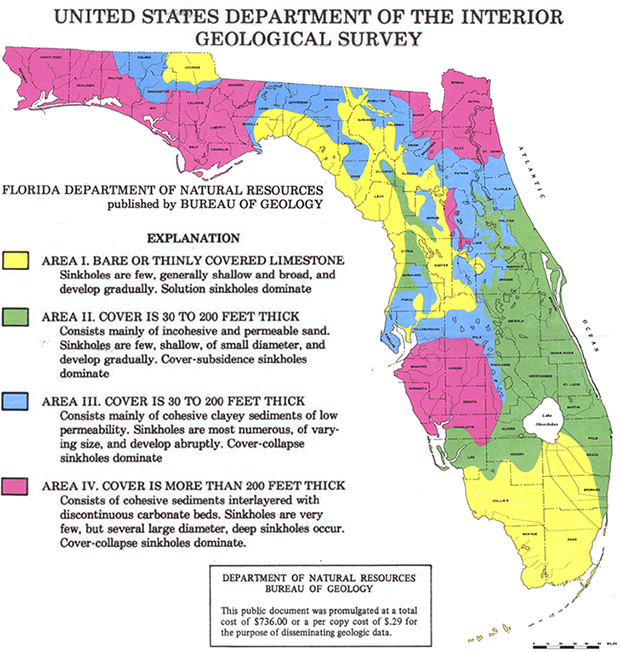 In large parts of Florida and other states, a soluble subsurface geology called karst is conducive to sinkholes. Karst occurs in rock dominated by gypsum, limestone or salt — which can dissolve, leaving underground streams and cavities. The U.S. Geological Survey says about 20 percent of the United States overlies karst terrain; the worst sinkhole damage occurs in Florida, Texas, Alabama, Missouri, Kentucky, Tennessee and Pennsylvania. Classically, sinkholes occur in locations where water, unable to flow laterally, percolates through soluble rock, creating caverns and cavities. Often, the surface will gradually subside, causing a cover-subsidence sinkhole. And as we’ll see, other forms of collapse are popularly called sinkholes as well. Gradual movement of soil grains into cavities in karst can result in a widespread form of sinkhole that is damaging, but not especially dangerous. More rarely and dramatically, when the roof span becomes too large, the outcome is a “cavity collapse” sinkhole. That was apparently the fatal flaw in Seffner, Fla. The undetectable underground changes can take centuries, until the earth gives way with a sudden, dangerous collapse. Cover-collapse sinkholes dominate in the blue and purple regions. At least one man was killed after a three-storey building fell into this 200-foot-deep hole after Tropical storm Agatha dumped more than three feet of rain on Guatemala. Rollover to see a street-level view. Pennsylvania, riddled with expired coal mines, has major problems with subsidence. In New Orleans and other river deltas, subsidence occurs as organic material in soil decomposes and new sediment, which would sustain ground level, is blocked behind levees. Parts of the Sacramento-San Joaquin river delta in California have fallen to more than 15 feet below sea level. Sinkholes can result when industrial and water-storage ponds get so heavy that they trigger a collapse. 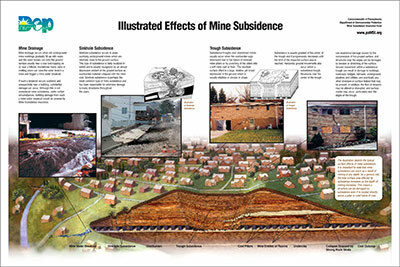 And then there is mining, which is a major cause of subsidence in Pennsylvania, West Virginia and Kentucky. Those states have about 60 percent of U.S. abandoned coal mines; overall, the nation has about 14,000 active mines, and up to 500,000 abandoned mines of all sorts. A collapse at the Retsof mine in Upstate New York had broad repercussions for the economy, landscape and groundwater. A telltale of subsidence. 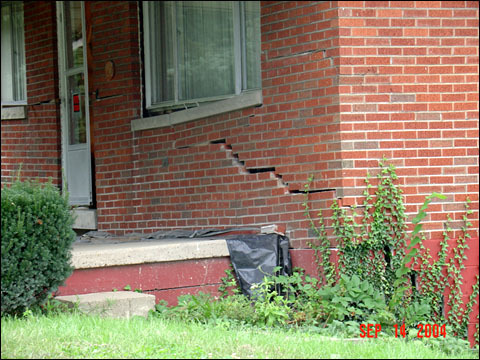 Don’t buy this house ’til you find out what caused that nasty crack! In 1994, an earthquake collapsed a 500-foot square chunk of roof rock above a huge salt mine south of Rochester, N.Y., and water began flooding in. Since the Retsof mine opened in 1885, it had grown into the world’s second-largest salt mine, covering 10 square miles. Within 21 months, the mine was inundated and closed. Water levels dropped in wells as far as 10 miles away, and two sinkholes formed, each about 50 by 200 feet. Further subsidence is expected as groundwater dissolves more salt; eventually, as the mine roof continues its slow-motion collapse, the ground above the mine is expected to fall eight or nine feet. 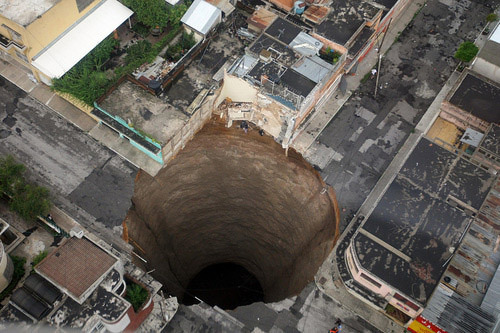 Sinkholes can be surprising, but they don’t appear at random. In sinkhole-prone states, state geological survey maps should provide at least a general guide to risk; the USGS also has a national mapping facility. Recognizing safe building sites in areas prone to sinkholes entails a multipronged approach, writes sinkhole expert Francisco Gutiérrez, professor of geology at the University of Zaragoza, Spain. This karst landscape shows how water carves conduits and cavities in limestone and other soluble rock. The river through the village of Minerve in southern France disappears into a swallow hole in the karst below town! 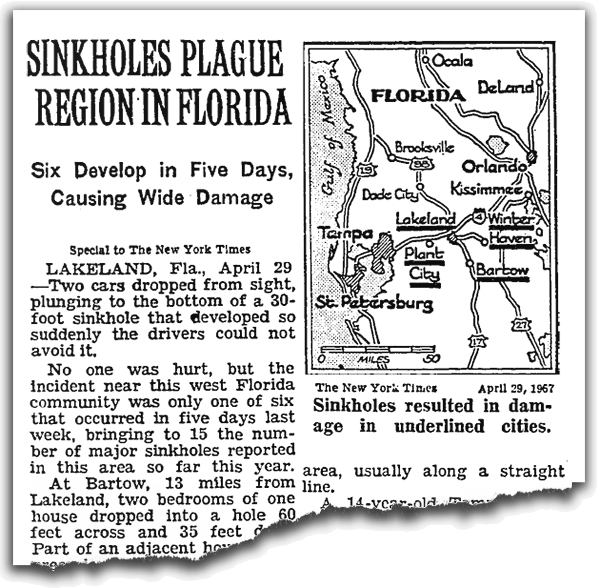 Sinkholes are nothing new around Tampa. 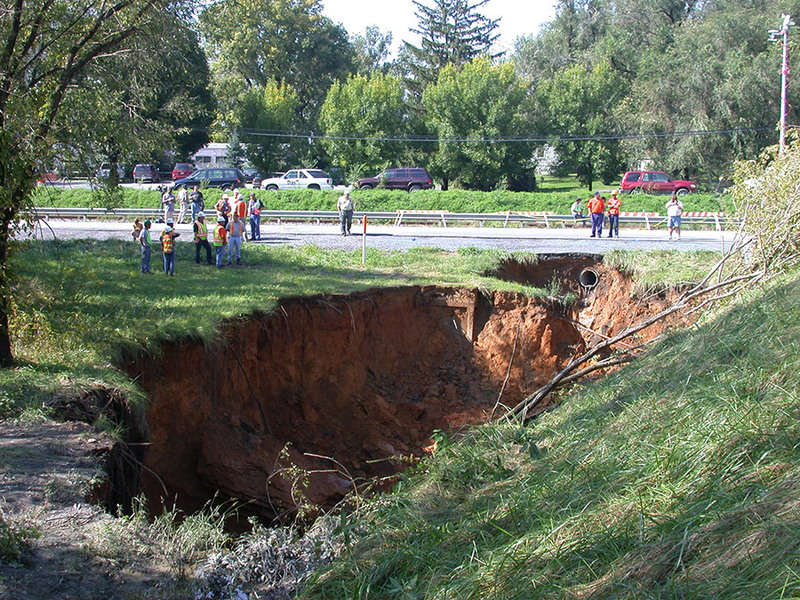 This cover-collapse sinkhole occurred in limestone near Frederick, Maryland. Many sinkholes occur along highways where rainwater runoff concentrates in storm drains and ditches and erodes the subsurface. That storm sewer pipe may have played a role in creating the sinkhole.